Bottomless wine, P1 meals, free pork buns, and more! 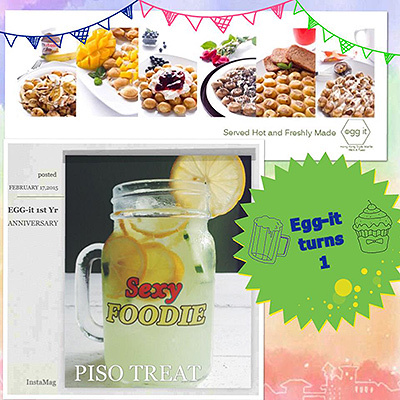 (SPOT.ph) When love is in the air, freebies abound in restaurants-and the fact that Chinese New Year is just a few days away gives us bigger and better deals. We’re talking wine promos, set meals for couples, and free desserts. 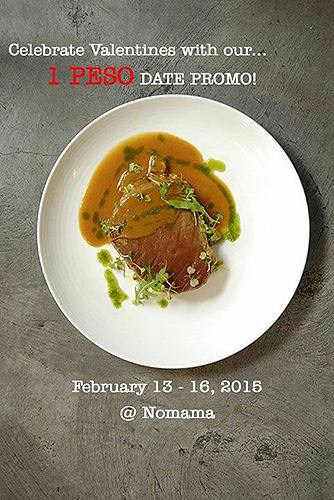 Nomama’s back offering dishes by the Piso, and even Ippudo’s feeling generous with-wait for it-free pork buns! More Valentine’s Day treats? Read our 10 Places to Get Free Dessert on Valentine’s Day. 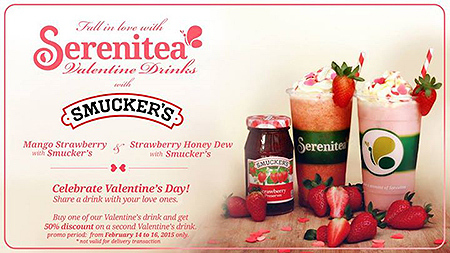 Buy any of Serenitea’s Valentine’s drinks from February 14 to 16, and get 50% off your second order. Choose from either Mango Strawberry with Smucker’s or Strawberry Honey Drew with Smucker’s. This famous hole-in-the-wall is celebrating their first anniversary. On February 17, cool off with their bestselling Cucumber Lemonade for only P1. Egg-It is a 6-F San Rafael Street corner Sta. Rosa, Kapitolyo, Pasig City. It’s a double celebration at this sweet palace. 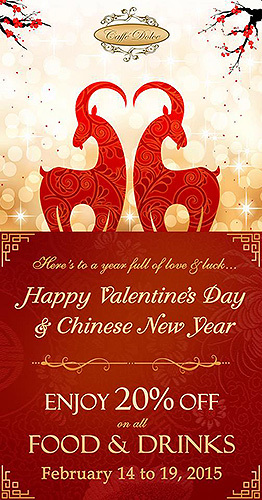 To celebrate Valentine’s Day and Chinese New Year, customers can enjoy a 20% discount from all of Caffe Dolce’s food and drinks from today until February 19. Caffe Dolce is at 848 Banawe Street, Quezon City. Ersao has has two special menus for Valentine’s Day. 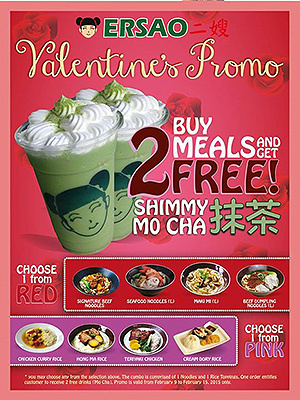 Choose one from the Red selection and another from the Pink, and you and your date can get two Shimmy Mo Cha (milk teas) for free! The promo is available until February 15. Click here for a list of Ersao branches. Today, February 14, and again on February 18 and 19, Huat Pot is offering a fun way to celebrate Valentine’s Day and Chinese New Year. If five people avail of their unlimited hot pot, a sixth can eat for free! Huat Pot is at Metropoint Center, P. Guevarra Street corner Wilson, Greenhills, San Juan City. 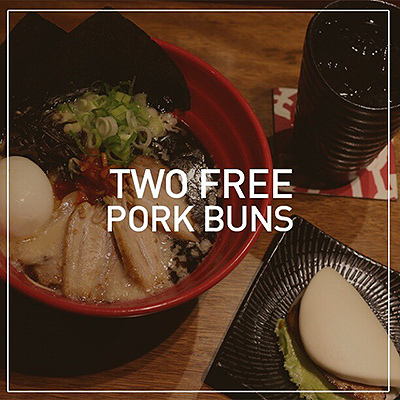 Bring your date to Ippudo, order two of the Special Ramen with bottomless drinks, and you get two pork buns for free! Ippudo is at SM Mega Fashion Hall, Mandaluyong City. Chef Him Uy de Baron is celebrating love and affordability by offering his Half-cooked Tuna Steak for only P1 this weekend. Nomama is at Capitol Commons, Pasig City. 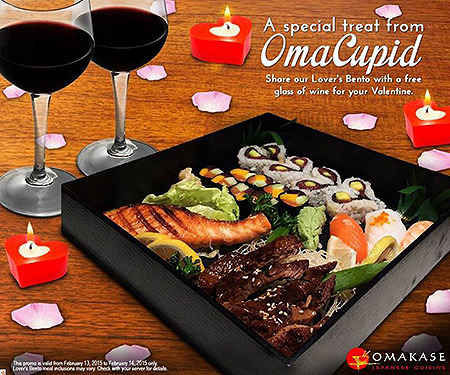 Order the Lover’s Bento today to score a free glass of wine for your date. Omakase has branches at Il Terrazo, Quezon City; Molito Lifestyle Center, Alabang, Muntinlupa City; Greenhills, San Juan City; and Ayala Triangle Gardens, Makati City. Get into that heady mood on Valentine’s Day. 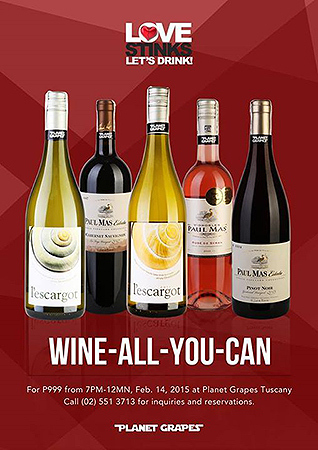 Pay P999 for wine-all-you-can from 7 p.m. to 12 a.m. at Planet Grapes. Planet Grapes is at Tuscany Estates, McKinley Hill, Taguig City. 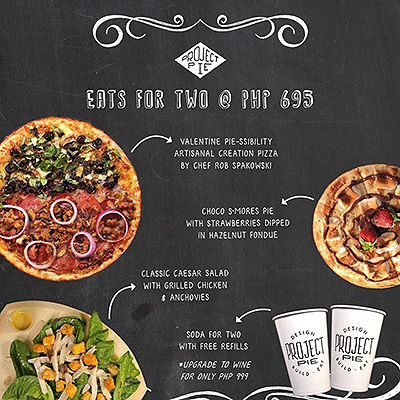 Imagine getting an entire feast for only P695-that’s one pizza in other restaurants. For this price, you get a Valentine Pie-ssibility (two flavors), Choco S’Mores Pie with hazelnut-covered strawberries, a Caesar salad, and two sodas with free refills. You can even upgrade to wine for P999. Click here for a list of Project Pie branches. 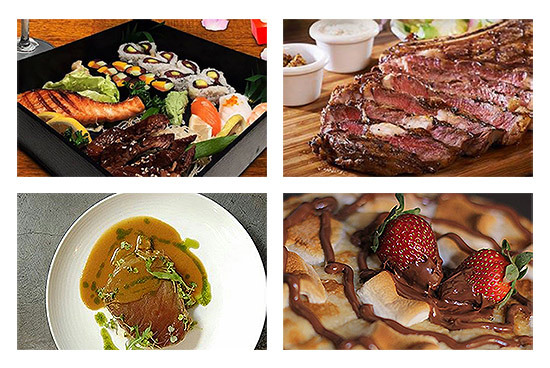 Enjoy a casual V-Day meal at Stackers for only P545. That comes with two cheeseburgers, three pieces of Baked Fried Chicken, and two 16-ounce iced teas. Stackers Burger Cafe has branches at Eastwood, Quezon City; Promenade, San Juan; SM North EDSA, Quezon City; and Alabang Town Center, Muntinlupa City. No food speaks of celebration better than steak, and steak is always better with a glass of wine. 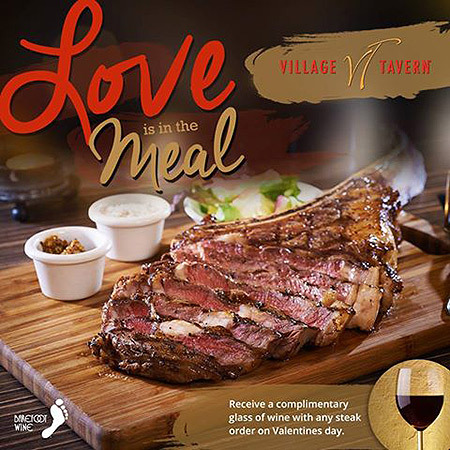 Any steak order at Village Tavern today gets you a complimentary glass of wine. Popcorn macarons exist in Manila!